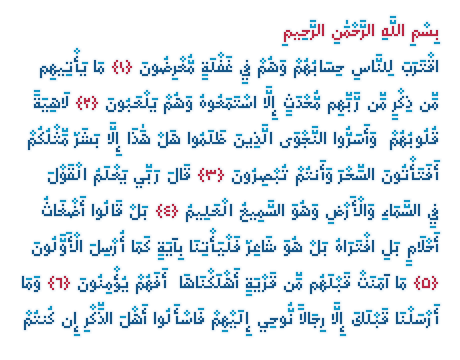 The Arapix is an almost traditional Naskh. It is elegant and easy to read even in very small sizes. 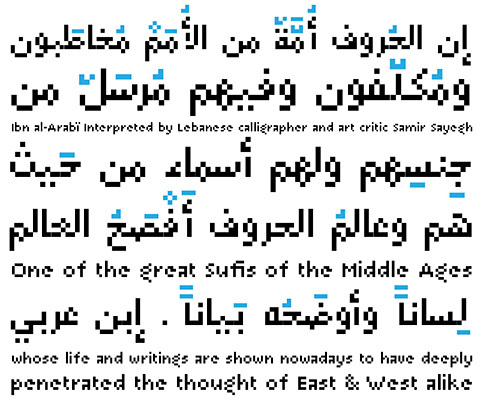 It includes almost every feature you would expect from a high range Naskh font. Its humanistic look and feel fits perfectly to its Latin counterpart. Arapix was originally designed for a web project that didn’t see the light a few years back. 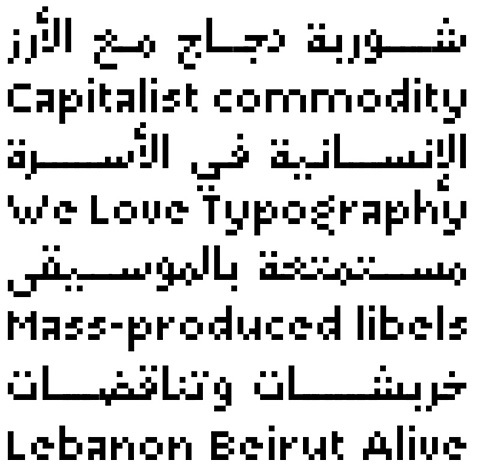 It started with the idea of fitting both Latin and Arabic into a 12 pixel vertical grid. The latin glyphs fitted properly within the vertical limits, but when it came to the arabic glyphs, it proved to be more challenging. 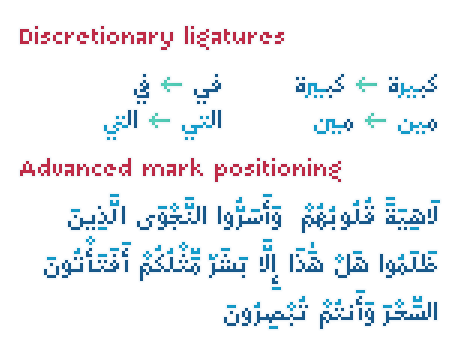 Arabic letters with lower diacritic dots like the (Yeh-fina) or letters with accents above like the (Alef-Hamza-above) need much more space than any Latin letter, add to this the fact that accents needs to be positioned above and below the glyphs. 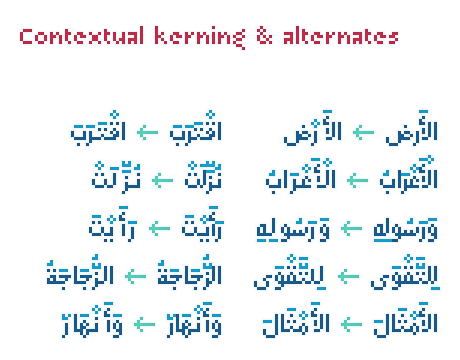 It is technically impossible to fit a (Yeh-fina-kasratan) or a (Alef-Hamza-above-shadda-damma) into 12 pixels. Initially the accents were dropped and not included in the design, but although it seemed impossible at the start, Sylvain Mazas found a solution in the end, including as many contextual alternates and contextual kerning as needed to avoid every collision between letters and diacritics, letters and accents, and diacritics and accents. 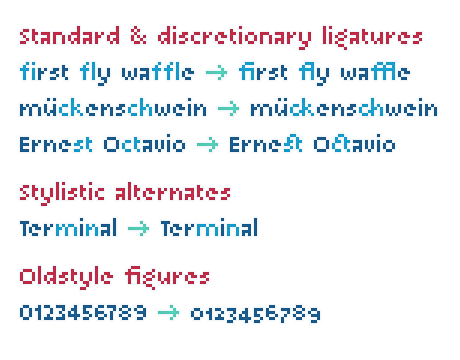 The contextual kerning was added to achieve an even letter and word spacing in longer text. Arapix is amazingly legible in small size on screen and in print. On the other hand, it also works perfectly as display titling font due to its unique and contemporary pixel approach. It can be used for screens with very low resolution as well as for high-resolution screens and prints. 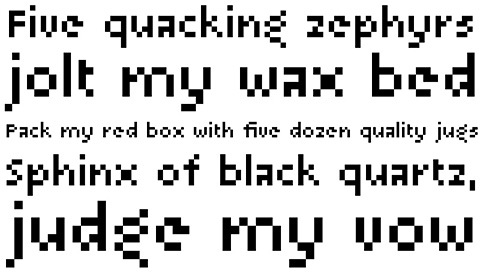 Arapix is a funky multilingual typeface inspired from the primitive pixel technology with modern characteristics. 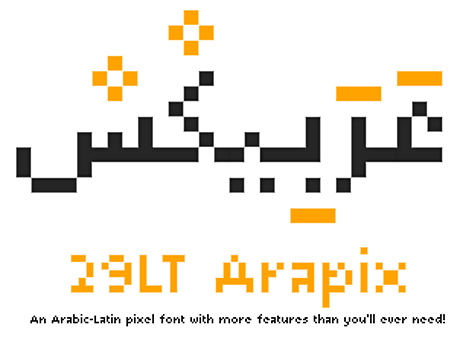 The new Arapix comes with a bunch of new features and new glyphs including Persian and Urdu letters, stylistic set, old style figures, contextual kerning, contextual alternates and a few icons too. Additional weights and special letters or icons can be added to the font if asked for by the users. Enjoy the new 29LT Arapix and have fun with it. Humanistic? It has the qualities in what would be the curves, but I think the pixels almost eliminate that feel. 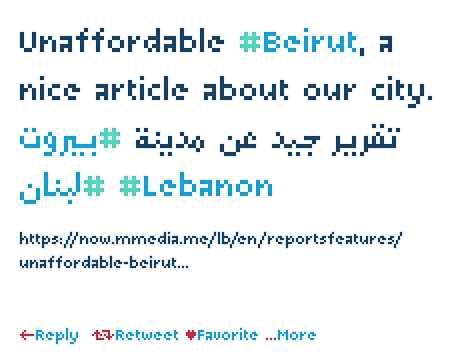 I like that it can function both in English and Arabic, but it is not pleasing to look at. It is fun, however; it reminds me of 80s video games. 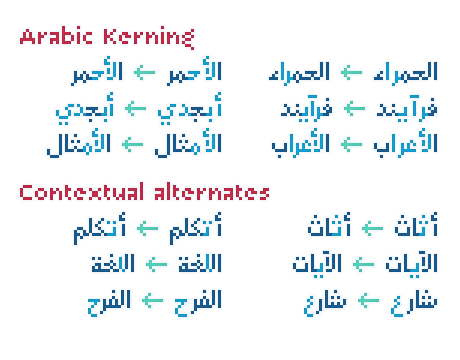 Humanistic in the sense that the arabic letterforms are following the Naskh calligraphic style structure and the the Latin the Roman letterforms even though it is a pixel font. If you look at the font in small size, you eyes will trick you to think that you are looking at a simplified naskh style and not a pixel font. This is a bold attempt but I am afraid it defeats the object. Instead of showing that Arabic is compatible with digital age, it tells the opposite. Arabic deserves to be looked at with passion, love and respect, especially among its own speakers. Arabic language has a hidden face that is modern and very strong, it is like the hidden face of the moon, it is there, but a lot effort is needed to show it and convince the common people of its existence! I welcome any comment about this subject and would be happy to give further information that proves that Arabic is the best language in the world. 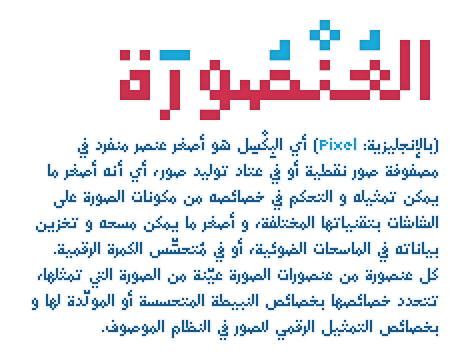 Creating and publishing Arabic pixel fonts is not in any way reducing the beauty of the script or ignoring the modern technology. 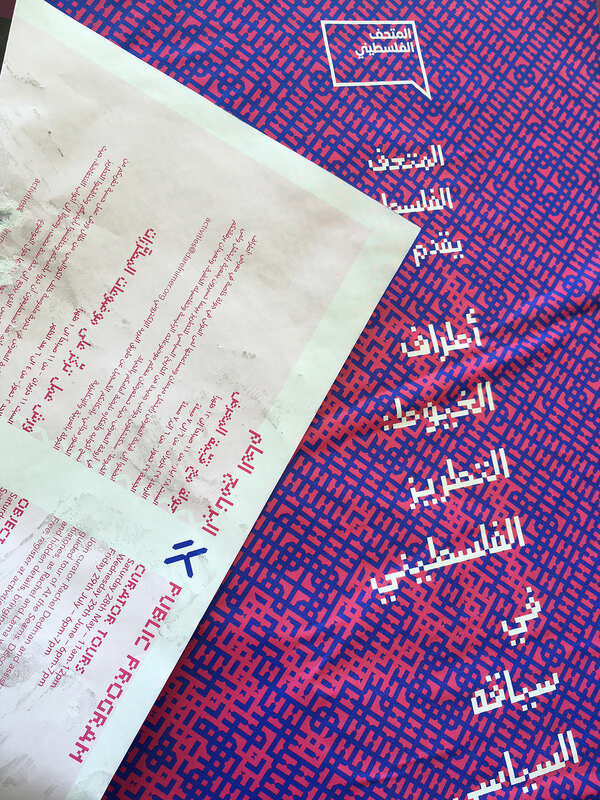 At 29LT we surely have the passion and the full respect for the arabic type, but at the same we are not afraid of experimenting and developing contemporary fonts. Arapix as is contemporary version of a pixel font that might have been created for the late 80s technology, but it is also funky and cool to be used as display type in our modern design and social life. Interesting take on this Pascal, impressive! It also reminds me of needlework when you look at it from a distance with the diacritical accents. Because when you do type with needlework it also follows a grid like structure making curves with a single stitch. So I have project in progress that requires Arabic script in Lego brand building blocks! Lego=pixelated! I think this font could be a great resource, to allow us as non native speakers to represent the great calligraphic tradition within the enormous constraints of those tiny bricks! Willing to help with just 4 short phrases? I’m slightly certain I’ll be told a lot of new stuff right right here!